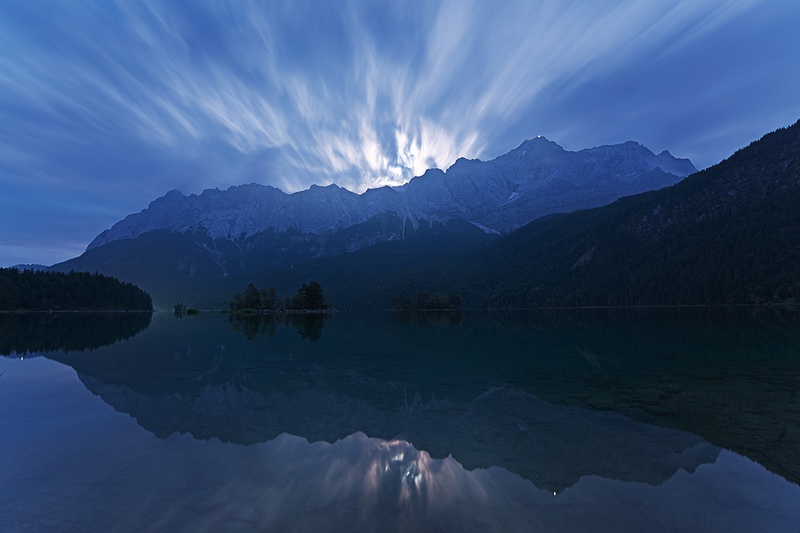 10 Reasons for Shooting the Blue Hour! Taken on a magical morning, the atmosphere was captivating, almost complete silence only seldom broken by the sound of cracking twigs or animal noises down in the forest below. Over the recent years I’ve more and more grown to prefer shooting the blue rather than the golden hour. It’s the time after the sun has set and the sky becomes colored in intensive blue light and oftentimes, depending on the cloud coverage, the landscape as well. Most photographers prefer the warm light of the golden hour just before the sun dips beneath the horizon, but here for your consideration I’ve gathered some reasons, why you should also consider shooting during the blue hour instead of picking up your camera and leave! Of course this is the first thing that comes to mind for many photographers; but I can’t stretch this enough. Often times I find myself – especially in the evening – at a spot I’ve been aching to shoot during a sunset, and there are still people around and tend to walk by, distracting me from my composition, walking through my composition or, depending on the size of the spot I might be standing in, even bump into me – this has indeed happened. Suddenly after the sun has vanished most people tend to lose interest in the landscape though and in a brief amount of time I find myself alone and can enjoy the serenity of engaging in photography without human distraction. This sense of having the spot to myself often translates into my image and makes it all the more valuable on a personal level. The second reason you should wait until the sun has set is that the light quality might still increase. Let’s say you have a hazy sunset. Often times due to the mercury falling the weather conditions can change swiftly after the sun has dipped behind the horizon and the clouds may dissipate and give way to a gentle and nice blue hue over the course of time before transitioning to black. 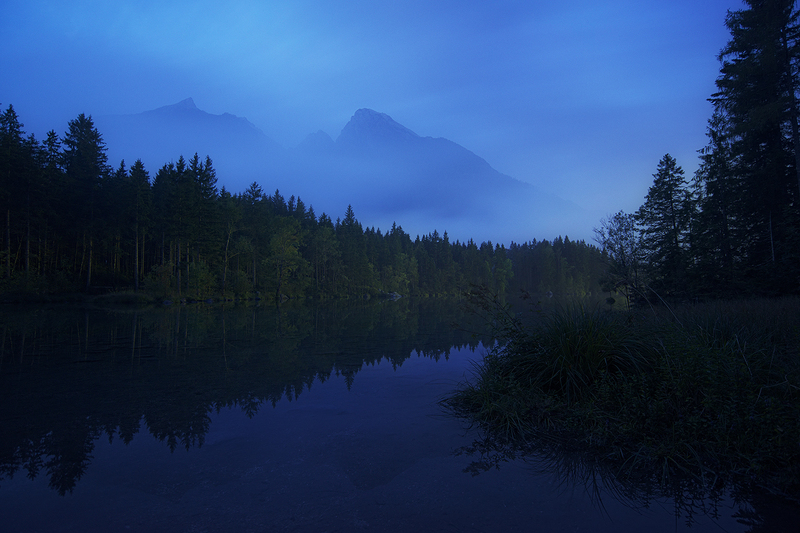 The opposite may be said about the blue hour in the morning before the sun has risen. This is the best time of day to get foggy conditions especially with high humidity resulting from showers the night before. 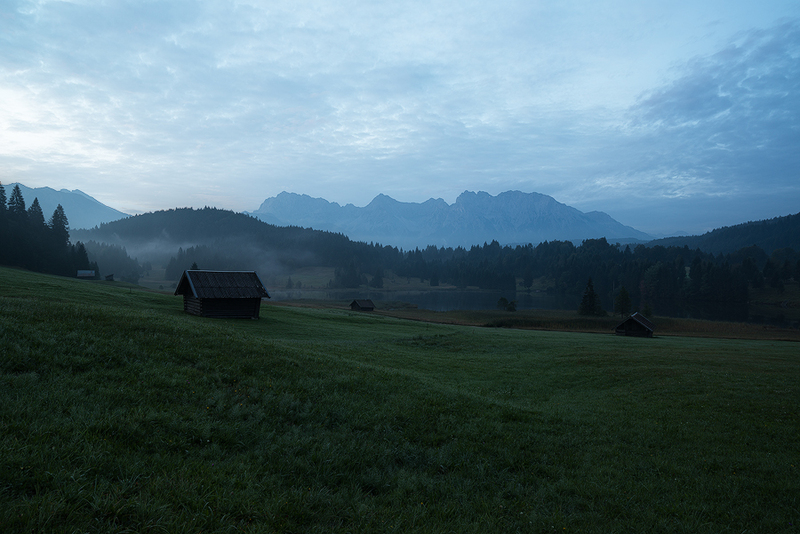 It is very rewarding shooting in early morning fog for it helps to isolate certain areas or objects within your composition, rendering scenes that would otherwise be loaded with distracting elements nice and orderly. In this case the foggy conditions offered me a unique opportunity to capture the clear foreground with the mountains partly dissembled in the fog, enabling me to shoot a really dreamy image. I know many people prefer blistering sunsets and scarlet clouds for their graphic impact but often times sunsets are dull and colorless, or they simply not breathtaking enough to keep up with what you may have seen on social media the day before. Even though this may have been the thing motivating you in the first place to finally get your camera out and go to that spot you figure you should’ve visited that day in spring, when the sky seemed to be on fire it’s often time preferable to simply wait for the blue hour after the sunset or start shooting before sunrise. The blue hour offers gentle blue hues that make for a dreamy look and also the air, due to the low temperatures, might be clearer from haze as mentioned before. Blue is after all the color of yearning and it helps to paint some usually even mundane landscape very interesting! These two shots were separated by a time frame of about half an hour. 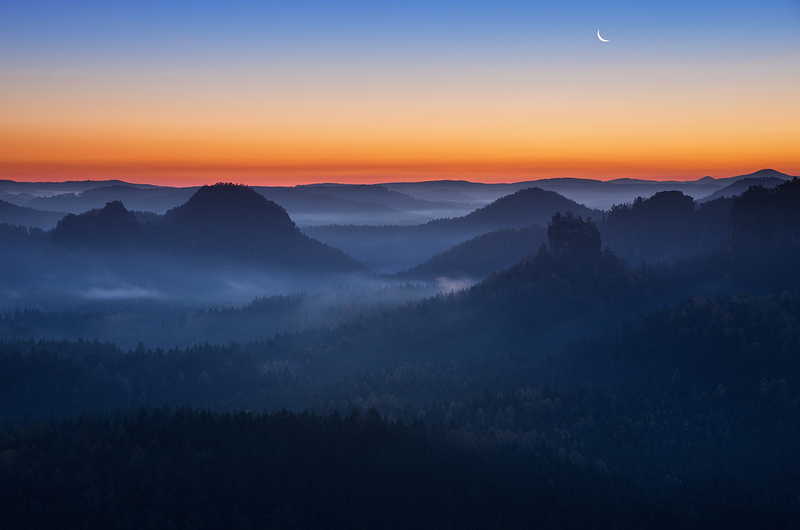 The upper one was taken shortly after the sunset and the latter in the late blue hour with the moon rising behind the mountain ridge. I had planned a sunset and glow on the ridge which wasn’t coming but just as well I knew the moon was about to ascend behind the mountain massif so I waited and hoped for a break in the clouds which fortunately came exactly when needed. I guess this was the reason why I tend more and more towards shooting during the blue hour no matter if in the morning or in the evening. With the advent of day there is a sense of getting to witness something that other people may not even appreciate or notice. The gentle lighting that appears long before the sun throws it’s light at you can be breathtaking, seeing how everything around you slowly comes to life – the first twitter of the birds, the first cow mooing, or even in the city meeting the guy who brings the newspaper at 4am in the morning and wishing him a good day. Getting up earlier than most can be rewarding in itself. I’ve always been someone, from the very beginning of my photography adventures actually, who was looking for something that the eye might not even be able to perceive, and with modern cameras (actually also almost just as good back in the film days) able to catch sights that we might not even be able to see there are a lot of possibilities to get otherworldly imagery. During the early or late phase – depending on the time of day – of the blue hour the camera can reveal little details that we cannot see. Often this is achieved by simply using a slower shutter speed unveiling for example the movement in the clouds, or the fog rolling in, the orange hues of light pollution against the sky or the first stars of the eve blinking in the sky already. 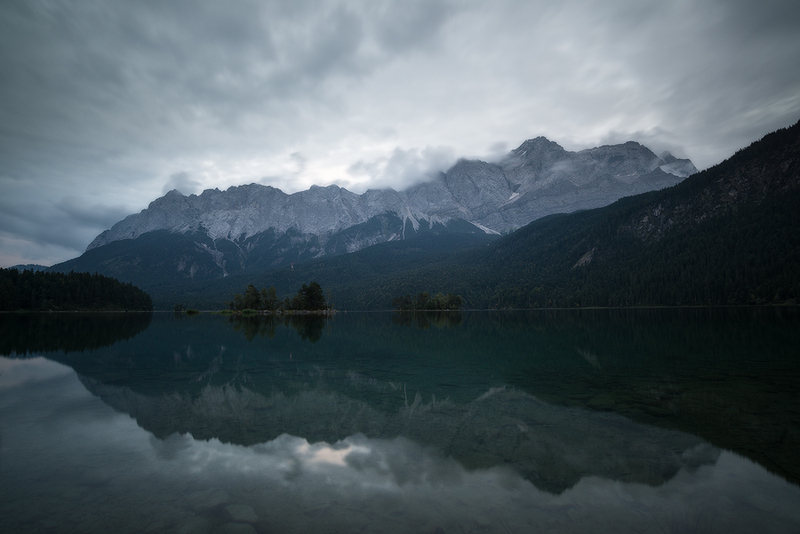 I love seeing what my sensor picks up, adding a sense of surreal wonder to my work. The image above was taken with the first light of day being reflected by the atmosphere and exposed for about 20 minutes. The patch of light pollution in the sky is able to balance out the little house in the foreground and the wavy mist makes for a gentle transition to the sky. The shot below was taken about an hour later and neither the length of the exposure, nor the fog or the blue hues are anywhere near the conditions before. I guess this reason is something for the pragmatist. Most of photographers also have to get a regular day job or have shift work. As an ardent photographer it hurts to miss the sunset or sunrise because of something as tedious as having to work to pay your bills. Still, if you make it past a spot on your way to home or work during the blue hour, why not simply get out of the car and capture the last photons the atmosphere reflects onto your chip? Often, when I drove to university, I had my camera with me and decided to stop by a small pond on the way to the highway and shot herons in the early dawn likewise I have often missed the sunset on a road trip due to unforeseeable time constraints or simply because I didn’t make it up the mountain fast enough. In the end I always had an image I was content with, nowadays even more so, because I’ve grown to prefer the blue hour. This leads me to the next point. You often see breathtaking stellar scapes all over the internet. And while most of them are taken at night, most of the compositions are set up during the evening. One of the ways to make sure that your night shots have sharp foreground is to shoot in the late blue hour, when you are still able to focus, and then simply let the camera sit for a while (you might want to look out for the lens fogging over though) until darkness falls and then shoot the same composition again with a wide aperture to get all the stars in – you can either add them in post-processing later, which has a common technique over the last years or even do all that with a double exposure in camera. Here I set up the camera and shot the foreground during the blue hour with sufficient light to get a foreground that was sharp and in focus, then after the milky way was clearly visible in the sky I shot the 2nd exposure for the sky and merged them in post-processing. As mentioned before with decreasing light, not light that has not arrived just yet, you have the chance to take long exposures – or rather there is the necessity to do so unless you want really noisy images which I doubt you do. Now I’m bringing this up because with daylight you usually need filters to achieve longer shutter speeds. Filters may cost money, you have to take them along and some lenses, especially ultra wide lenses sometimes don’t even take filters without expensive custom made holder systems. So to avoid this you simply use the absence of light to your advantage, and while it might be only a brief period of time to take longer exposures depending on altitude, longitude and time of the year, it can be sufficient to get in some great shots without having to invest in filters. Same goes for getting an even exposure, at daytime the sky oftentimes is way brighter than the foreground you’re shooting and during the blue hour the light is more balanced between sky and the earth so you won’t need multiple exposures or GND Filters to get an even exposure either. 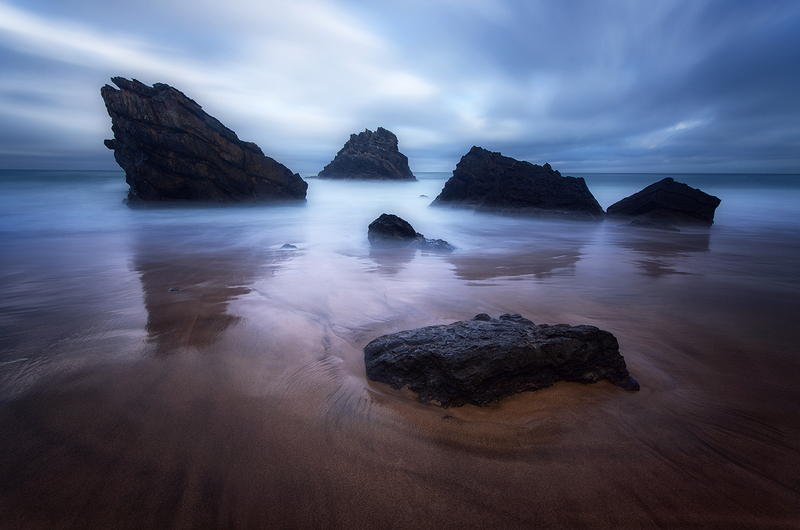 Rain, wind and the relentless tides are the elements that forged these characteristic rock formations at Praia da Adraga in an endless flow of time. With this long exposure I tried to capture this sense of fortitude. Coming back to my earlier argument about being able to shoot on weekdays. Another related though thought is that after you have gotten up at 5am in the morning and shooting past 7am before the sun rises, or even an hour longer to get in the nice golden light of the nascent day. It’s 8am and the whole day is still there for you to tinker with. It might be a minor aspect for some but I love having the day to drive to the next location – or even being able to climb down a mountain drive to the next one and walk up again to be in time for the next sunset or blue hour shot I may want to take. And when you’re at the ocean you may even make it onto the surfboard before the tourist swell rolls in. 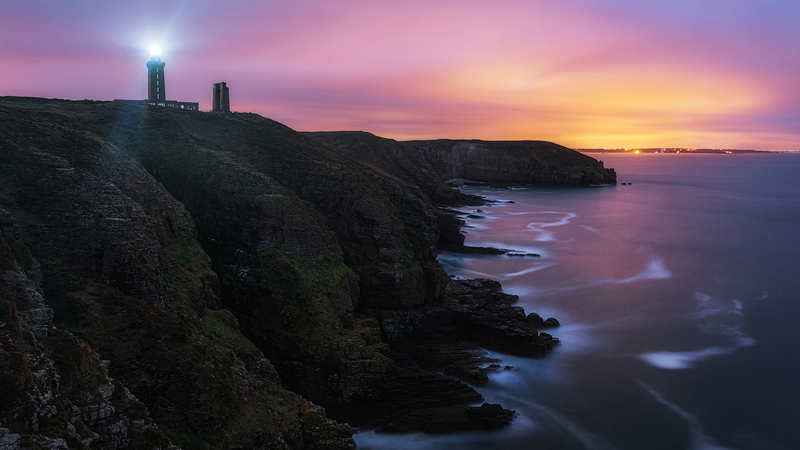 Long after the sunset with the remaining light coming in from the ocean tinting the water and the cliffs still gently blue the light pollution was already bursting out into flames. Shortly after this was taken the blue was completely gone, and everything had the ominous glow of the city and the scenery was only half as interesting as pictured here. Another point I have to share is that, in the unlikely case that you’re not sitting alone at 4am on top of a mountain there is a reason for it, being that you’re not the only one dedicated enough to get up that early to enjoy the blue hour. Chances are that the guy next to you is just as much of a passionate photographer as you are, which is a good thing. This may sound like a antithetical argument to the way I started the article, but I have met several interesting peoples over the years and had some great conversations with them, getting some insider information about the spot or other spots in the vicinity, about certain techniques or maybe just about how we know the same people from the online realm and that we like the same photographers. I hope this shot summary will motivate some people to stay the extra hour or get up earlier to reap the benefits the blue hour has to offer for us landscapers. Just don’t forget to bring warmer clothing – a lens warmer might be helpful too, as well as some gummy bears or a themos jug of hot beverage. And if you’re in for longer captures way into the night, better bring something to sit on, the ground may get cold deepening on the time of year. 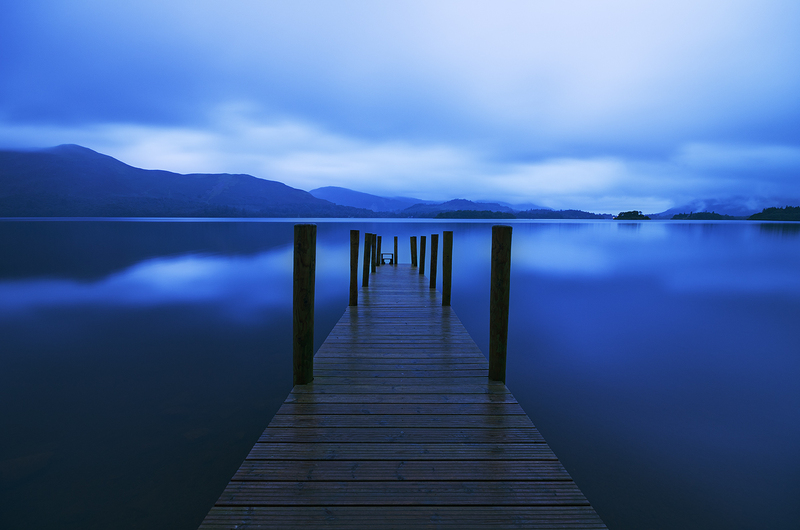 The classic jetty view of Derwent Water, one of the most photographed locations in the UK. But you rarely see it pictured during a rainy blue hour even though the Lake District is one of the most humid areas of the island. 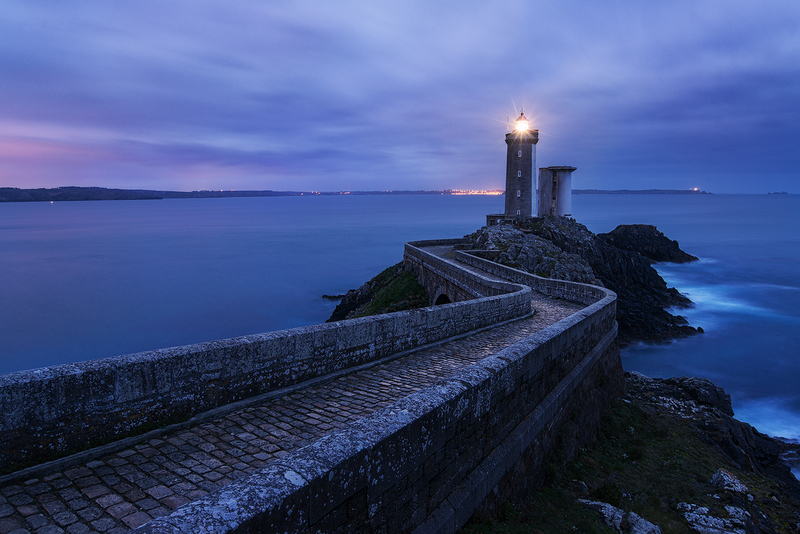 After the full moon drifts past the horizon, for a brief moment before the sun rises, the scenery around the lighthouse Phare du Petit Minou is painted in bluish, scarlet light and the flare glimmers on the stone pavement leading up the the building.